- 5 x 50ml/ 1.7fl.oz. Ingredients: Caprylic/Capric Triglyceride, Sodium Chloride, Maris Sal (Sea Salt), Laureth-4, C12-15 Alkyl Benzoate, Silica, Dimethicone, Glyceryl Sterate, Parfum (Frangrance), PEG-100 Stearate, Menthyl Lactate, Citrus Limon Peel Powder, Aqua (water), Glycerin, Alcohol, Lecithin, Ruscus Aculeatus Root Extract, Citrus Limon (Lemon) Peel Extract, Solidago Virgaurea (Goldenrod)extract, Phenoxyethanol, Caffeine, Caritine, Centella Asiatica leaf extract, Potassium Phosphate, Benzoic Acid, Benzyl Salicylate, Hexyl Cinnamal, Limonene, Eugenol, Citral, Linalool. 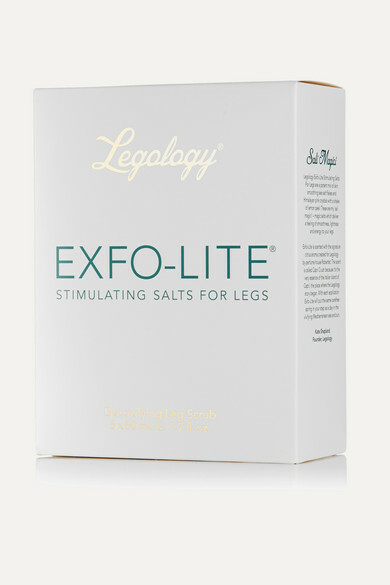 Working for some 25 years as a beauty journalist has instilled Legology founder Kate Shapland with a fascination for leg health. Targeting cellulite directly at the cause, this oil-based exfoliator stimulates both blood flow and the lymphatic system to deeply detoxify and work against water retention. Astringent lemon peel and polishing salt flakes leave skin soft and supple, while the handy single sachets ensure there's minimum mess - even when traveling.